This is a very easy shot but gives a great effect. 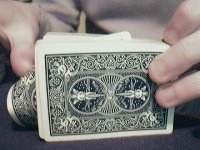 As seen on World Greatest Magic by Jean Pierre Vallarino. 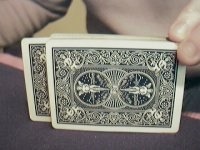 Hold the deck on his side with the left hand. Now the back of the deck is facing the audience. Take a card and put it in the deck from the right side, the card is about 1,5 cm (0.5 inch) sticking out of the deck (like a big step). Push down (and towards you) on the card so it bends, and release the card, it will shoot up. See pictures for the move. It can be used a card revelation.